Braga it’s a city with more than two thousand years of history, and since the roman’s presence it has always been an important area. Today it is the third Portuguese city in terms of importance (after the capital Lisbon and Oporto). Braga is a very important religious centre in Portugal: Braga’s Cathedral (Sé de Braga, 12th-18th centuries): the most important historical monument of the city. Rich mix of architectural and artistic styles; Bom Jesus do Monte Sanctuary (18th-early 19th century): Neoclassic church with a magnificent baroque stairway and Sameiro Sanctuary (19th-20th centuries): Important pilgrimage centre dedicated to the Virgin Mary express it very well. Apart from its history, it lays in Braga a modern city. And for that much contributed the Minho’s University, founded in 1973. One of the then named "New Universities" that, at that time, deeply changed the landscape of higher education in Portugal. Located in Braga and Guimarães, known for its significant economic activity and by the youth of its population, University of Minho has played the role of development agent in the region. Braga was once identified as the European youngest city. 44% of Braga’s inhabitants have less than 30 years old. And one, in each four citizens, has between 15 and 29 years old. We are here today representing them. 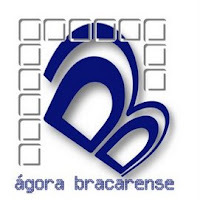 Ágora Bracarense it’s a Portuguese civic organization. And in its majority it is composed by youngsters. Recently founded, by a group of friends, we represent the huge willpower to do something in our hometown and in our region in what it concerns to civic participation where young people must have a word to say. It was not easy our first steps, but now we have a project and are determined in carrying it out. We have several goals in our action plan. We are a group of young people, but we have great perspectives and much work in front of us. Our main goal, one of our major intents it’s to try to call to front line young people with ambition and willing to participate, to be active actors, give them opportunities to show their skills and “spread” their ideas. As in ancient Greece, we intend to be an Agora, the place of public debate. It is very important for youngsters to express their opinions and wants. We desire to discuss youth issues, because we are aware they exist and we believe that any of us has the power to do something. We have dreams, but we also have strengths to shape the world. At Ágora Bracarense we share opinions, but also debate different points of view. From difference comes complementarity. And it brings us profits, added value. We’ve had identified a lack of civic participation by young people. Youngsters care about themselves, about their personal problems. But with some of their selfishness they do not see their problems at a global scale. So, instead of trying to change the route, they just let them go, sometimes not in the right direction. What we want is to call their attention. Call them to chat, to discuss, and to say their words. The word it’s an extraordinary weapon, but not every youngster use it. And Agora must be the perfect place to express it, because it is the place of citizenship. As association we haven’t got much experience, but we join together several people with previous experiences in many associations. We are probably here more to ear from you, and to learn. But we consider ourselves enthusiasts of civic participation. We are a melting pot of various youngsters with different lifestyles, but we share the same ideals. We are students, teachers, unemployed people, and professionals. But we are all young people, and has we are young, we have the world in front of us. And we like to face it. And we all believe that, as a Portuguese poet said once: “when man dreams, the world jumps and goes forward, just like a colorful ball in a kid’s hand”. Great António Gedeão! When a man dreams... Go for it Agora!